A2 folded multiple. Edition of 1000. Commissioned by Warwickshire Artsweek & Arts Council England. The A2 multiple The Street depicts on the front an aerial photographic image of Stratford upon avon town centre and on the back the sky above this terrain. 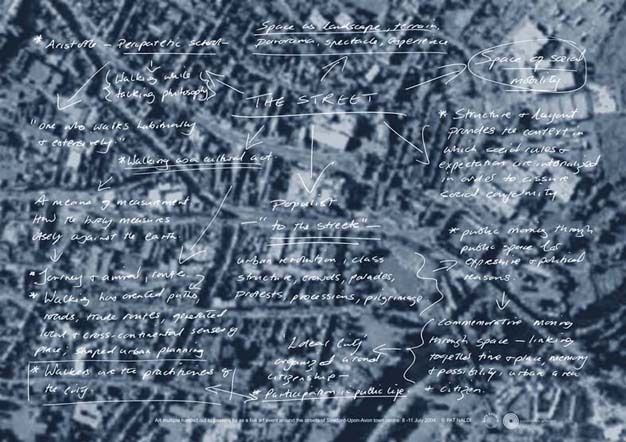 Engaging with conceptual forms of urban mapping, trains of thought linking urban space with walking, politics, time, and digital technologies are 'mapped' onto the images. Over a period of four days The Street multiples were handed out to passers by whilst walking along busy outdoor locations around Stratford town centre. The leafleting event explored and investigated strategies and approaches for audience interactivity, accessibility, mass communication and dissemination within the extended geographic area of urban spaces.